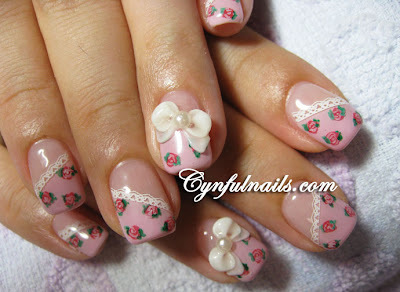 Cynful Nails: Welcoming spring/summer with floral designs. 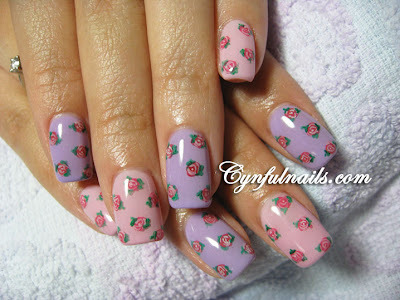 Welcoming spring/summer with floral designs. Finally got a little time on my hands today to resize photos and upload them. Since the weather is getting warm these days, cool yourself down with some floral nails~ It makes people happy just by looking at them. It's nice to see a little blue instead of the usual sweet pink stuff. 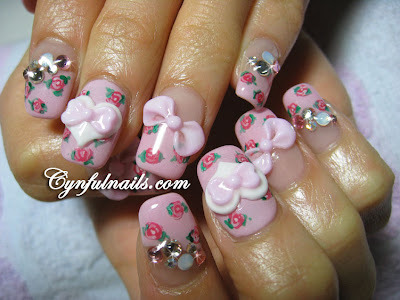 :D Outlined the pink ribbons with silver glitter, just like what I did to the bridal pink flowers. Pastel yellow with peach orange hand painted roses. I like this color combination. Hand painted the scallop lace along the french line. <3 I have one girl who loves this design so much that she came back a month later (usually to change a design)to repeat the same design. Hehe. Now the sweet and girly stuff. A simple set with purple and pink. 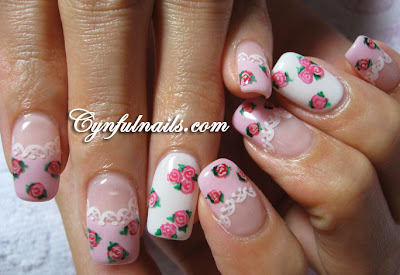 The lace makes it look so demure and girly. Love all of these, the little roses are so sweet.